I am in charge of implementing Asprova that creates production schedule and purchase schedule at high speed, for much varieties of items which are going through multiple processes with different capacity, while integrating manufacturing orders, sales orders and inventory stock. Today let me explain the overview of Asprova, how Asprova will work to create production schedule and purchase schedule. Now it’s early (middle of, end of) October, so you have already got sales order of October and customer forecast of November. 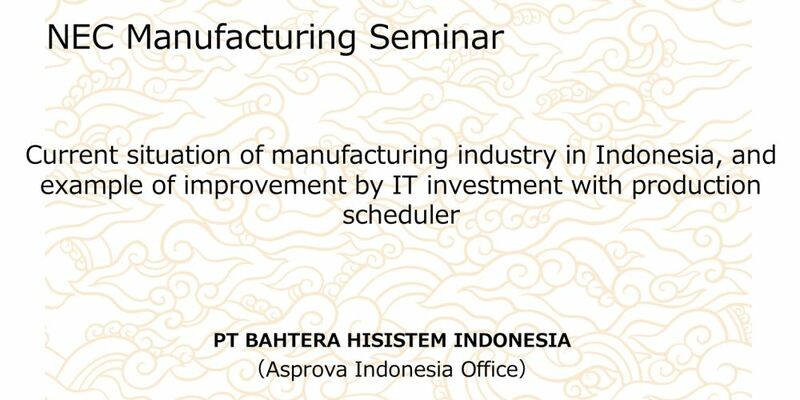 Based on this information, Asprova create master production schedule (MPS) which is the production plan on the finish date basis after reducing finished goods stock. And then executes MRP to create manufacturing orders which suggests the required quantity of component parts according to the bill of material (BOM), and suggests the production start time and the production end time. Next Asprova assigns manufacturing orders to machines on each process while keeping the load balance. This result is production schedule. In addition, calculate required quantity of raw material and suggest the latest date when purchase order should be issued based on production schedule. This result is purchase schedule. As I said just a before Asprova automatically creates production schedule while optimizing your production resources based on finite capacity which means cycle time basis for each combination of item and machine. But the meaning of optimization is different for each factory. There is a factory which is making the same product as many as possible at one time to reduce machine setup time. On the other hand there is a factory which is making the products according to the delivery date to reduce inventory stock. What is the optimization? This question is the same as the question, what is the best food in the world. Absolutely this answer would be different for everyone. But generally all factories trend to shorten production lead time, want to reduce inventory stock, and hope to increase company profit. If you use Asprova, you can create the simulation of production schedule to look for the optimization specially for your factory. Import master data, sales order and inventory stock. Until now I have explained the overview of Asprova, but this is just theory. So it seemed to be a little bit complicated, but actually practice to use Asprova is quite easy. First we prepare master data which includes integrated master, calendar table and shift table, and then import these masters with sales orders and inventory stock into Asprova from csv file or DB. We can connect to Asprova with several data format using field mapping tool just by drag and drop. Now I am ready to create production schedule using Asprova. Creating production schedule is called re-schedule in Asprova terms. This is the production schedule by production resources. On the left side you can see the machines according to the production flow from the first process to delivery. This chart is called resource gantt chart which shows what job should be worked on the each machine. In this schedule production lead time was calculated based on the delivery date back to previous process, so inventory stock level will be minimized. This scheduling method is called JIT famous for Toyota Production System. Now we change the scheduling direction starting from now forward to the next process to finish production as soon as possible, so we can specify when production will finish if start now. This scheduling method is called forward scheduling. In case of coming urgent order, we must answer as soon as possible when we can deliver this. But actually this schedule has many back orders. Obviously some orders look red which means loading over, and it will cause delivery delay. To avoid delivery delay we add overtime by changing shift pattern in resource gantt chart. If some machines has problem in one day, we are forced to use alternative machine. By changing shift pattern from ‘working time’ to ‘non-working time’, Asprova automatically changes to assign manufacturing orders to alternative machine based on integrated master. Sales order changes everyday depending on the request from customer. When we get urgent order from customer, production schedule should be updated. Asprova automatically adjusts entire schedule according to the impact of urgent order. Now let’s see the movement of stock level in inventory graph to know how much KG of raw material will be used in a day. Now purchase lot size is 200 KG in one time. This amount will be used for about 3 days, so we should issue purchase order of raw material about 10 times in a month, because 30 days divided by 3 days is 10 times. But now if we reduce frequency to issue purchase orders of raw material, for example from 10 times to 2 times in a month, how much KG of purchase lot size is the best? 200 KG of raw material are for 3 days, so 200 KG multiplied by 5 is 1,000 KG for 15 days. Now we issue purchase order of raw material after raw material stock finished totally. If suppliers are locating near from here, we can order raw material at any time because purchase lead time is short enough to supply raw material to production process continuously. But if suppliers are located far from here, problem will happen, because purchase lead time is too long. Our production will stop because of raw material shortage. We had better keep minimum stock to avoid stock shortage. By setting a minimum stock level for raw material, Asprova automatically generates purchase orders according to the lot sizing rule to keep the stock level from falling below the minimum stock level. Asprova automatically create production schedule based on scheduling parameter which is the basic setting to control scheduling result. But finally when we issue upcoming daily work order, we adjust the scheduling result by manual from resource gantt chart. We can move manufacturing orders to the other date and time, not only in the same resource but also to the other resource just by drag and drop. After adjusting scheduling result, we fix manufacturing order and issue work order in excel format. Operator would work according to this work orders, and input actual production result in Asprova to make the next production schedule more accurate.